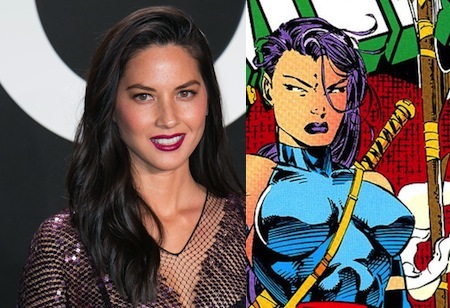 Olivia Munn Joins X-Men: Apocalypse as Psylocke! The ensemble cast of Bryan Singer’s X-Men: Apocalypse expands today as the director reveals that Olivia Munn (“The Newsroom,” Magic Mike) will be playing Betsy Braddock (aka Psylocke) in the upcoming franchise sequel! James McAvoy, Michael Fassbender, Jennifer Lawrence, and Nicholas Hoult will lead the cast of X-Men: Apocalypse, which will also see the return of Rose Byrne as Moira MacTaggert, Evan Peters as Quicksilver and newcomers Alexandra Shipp, Sophie Turner, Kodi Smit-McPhee, Ben Hardy and Tye Sheridan as young versions of Storm, Jean Grey, Nightcrawler, Angel and Cyclops. Oscar Isaac is also starring as the film’s title antagonist with Simon Kinberg scripting from a treatment by Mike Dougherty, Dan Harris and Kinberg. Said to be the conclusion of a trilogy started with X-Men: First Class and continued with X-Men: Days of Future Past, X-Men: Apocalypse is set for release on May 27, 2016.